LicenseCrawler is a free key finder program that I've found to be very good. 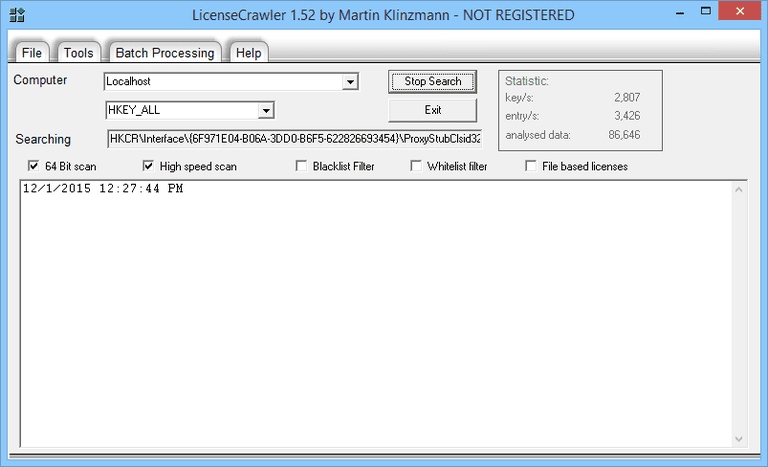 LicenseCrawler is simple to use but very impressive with the variety of serial numbers and product keys it finds. If you're getting ready to reinstall a major application but can't locate its product key or serial number, LicenseCrawler will likely be able to help. It found the serial number to nearly every important program I had installed on my computer. This review is of LicenseCrawler v2.1, released on March 17, 2019. Please let me know if there's a newer version I need to review. I was very impressed with LicenseCrawler. When I first took a look at the program, it looked simplistic and I wasn't expecting much. Not only did LicenseCrawler find my Windows 10 & 8 product key easily, it also found the serial numbers for several programs that no other key finder program I've used had ever found. Aside from how effective LicenseCrawler is at finding serial numbers and product keys, I really liked the simple results window. It's a little crowded with some generally useless registry information but I liked how easy it was to scroll through the results to find what I was looking for. Several programs were found that didn't make a lot of sense - like Internet Explorer and Windows Media Player (neither program requires a serial number since they're both free and included in Windows) - but that's also a testament to the unique scanning ability of LicenseCrawler. The program should be able to locate a seriously impressive list of programs. If you've had problems locating a program's serial number or product key with another key finder program then I highly recommend trying LicenseCrawler. The full version of LicenseCrawler is $11 USD and supports blacklist and whitelist filters, and will disable the commercial pop-up list. To use the software in a commercial setting, you have to buy a company license. Didn't find what you were looking for with LicenseCrawler?